London - Queen Elizabeth II on Wednesday officially opened the London Paralympics, at a showpiece ceremony aimed at challenging perceptions about disability and celebrating the triumph of the human spirit. The 86-year-old declared the Games open in a short speech in the traditional curtain-raiser to 11 days of sporting action at an event involving over 3 000 performers, many of them with disabilities, after a fly-past by a disabled pilot. London 2012 chief Sebastian Coe said he hoped the Games "would be a landmark for people with a disability everywhere, a landmark in the progress of mankind towards the light, towards seeing immense capability and possibility". The president of the International Paralympic Committee, Philip Craven, added that the Games were "a celebration of the human spirit" that had "the energy to change each and every one of us". The show began with a rare public appearance by Britain's most famous living scientist, Stephen Hawking. Hawking, author of the best-selling "A Brief History of Time" who has motor neuron disease and has been paralysed most of his life, was described by organisers as "the most famous disabled person anywhere on the planet". He guided a central character on a journey of discovery in a story inspired by William Shakespeare's "The Tempest", taking in the "Big Bang" theory on the creation of the universe about which he has written extensively, to the 18th century "Enlightment" period and scientific discoveries of the modern era. 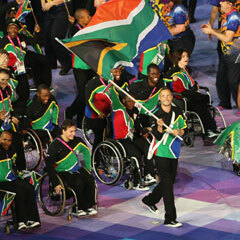 The ceremony was billed by organisers as a "celebration of the inspirational spirit of the Paralympic Games that challenges perceptions of human possibility". Margaret Maughan, Britain's first Paralympic gold medallist at the inaugural 1960 Games, was given the honour of lighting the cauldron, made of more than 200 "petals" and engraved with the names of participating countries. Townsend, a Royal Marine commando, lost both legs when he stepped on a homemade bomb in Afghanistan but is now an aspiring Paralympic triathlete hoping to compete in Rio de Janeiro in 2016 when the sport makes its debut. Among the 80 000-strong crowd were the queen's grandson Prince William and his wife Catherine, British Prime Minister David Cameron and London Mayor Boris Johnson, with the event broadcast to millions around the world. Britain is considered the "spiritual home" of the Games, as the first recognised sports events for athletes with disabilities was held in Stoke Mandeville, southern England, in 1948. The flame - created from four others kindled on the highest peaks of England, Scotland, Wales and Northern Ireland - was brought to the venue in a 148-kilometre (92-mile) overnight relay from Stoke Mandeville to London.